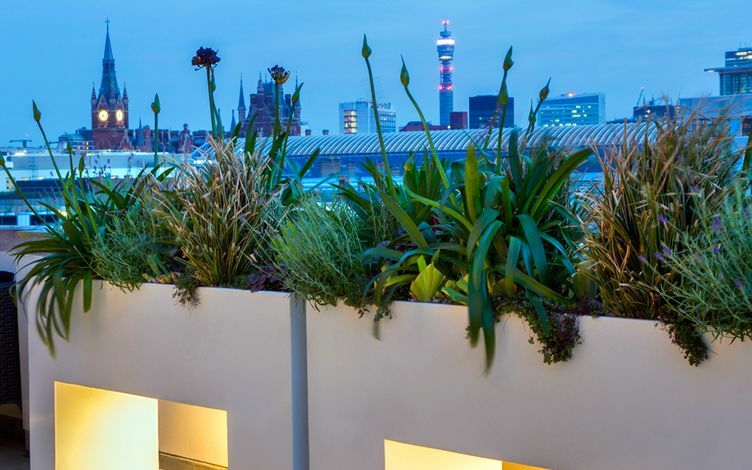 We focus on designing and building modern roof terrace projects across Central London, where an expanding myriad of remarkably small roof gardens continues to redefine urban living in the private sphere. 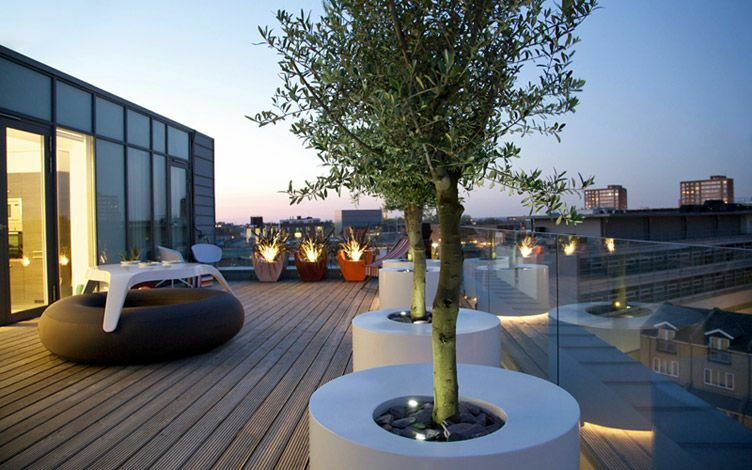 With limitless palettes of materials, planters, plants, seating, screening and lighting, the outdoor potential is truly vast – a premise sustained within an astonishing gamut of utterly compact roof garden terraces, broadened way beyond their mere square metreage and into a captivating skyline. 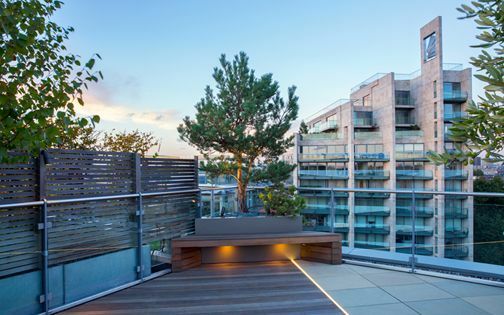 These dynamic city gardens, perched high above London's urban streetscapes, endorse, embrace and extend pertinent diversity in a significantly verdant, silhouetted canvas en masse. 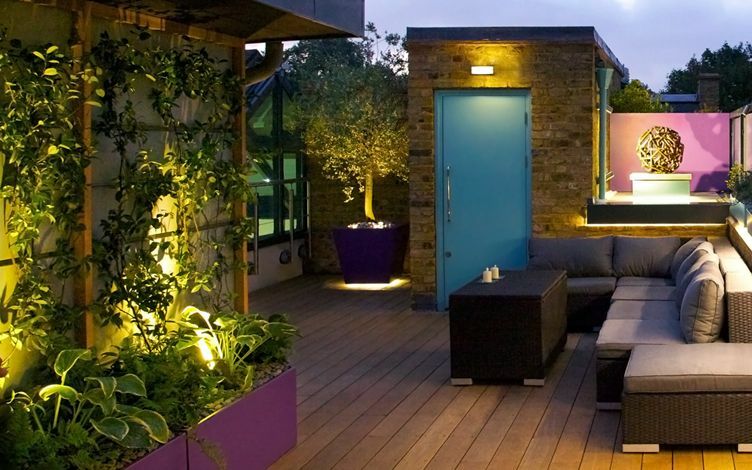 Roof: 5th floor penthouse conversion, London EC1. 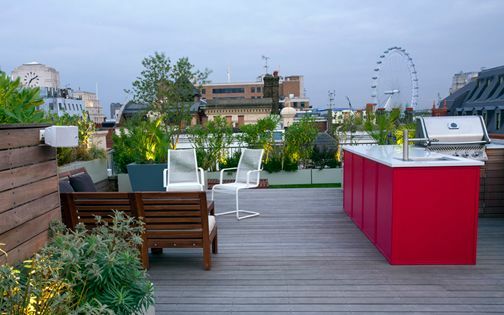 Terrace: 80sqm across 3 small roof terraces. 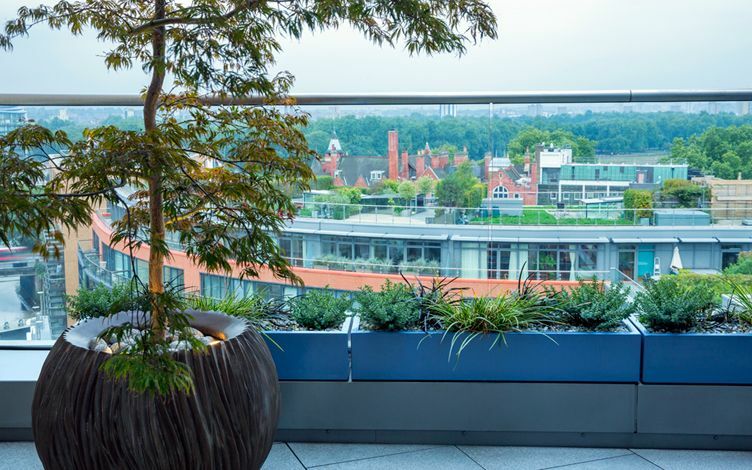 Garden: custom-made planters including indoor vase designs for a contemporary art collection, multi-stemmed Silver birch, Ginkgo and Japanese Maple trees, specially commissioned sculpture, powder-coated expanded aluminium privacy screens. 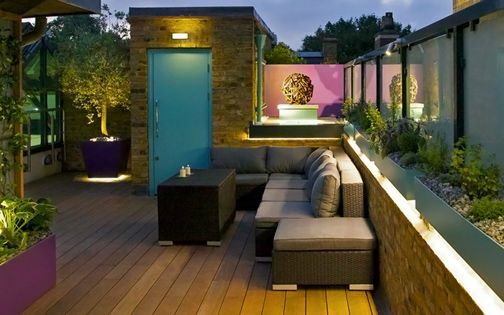 Roof: 11th floor penthouse, London SW1. 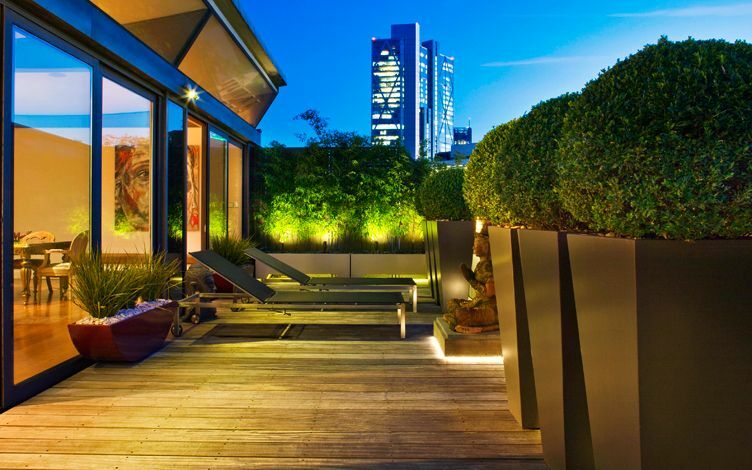 Terrace: 50sqm across 4 small rooftop terraces. 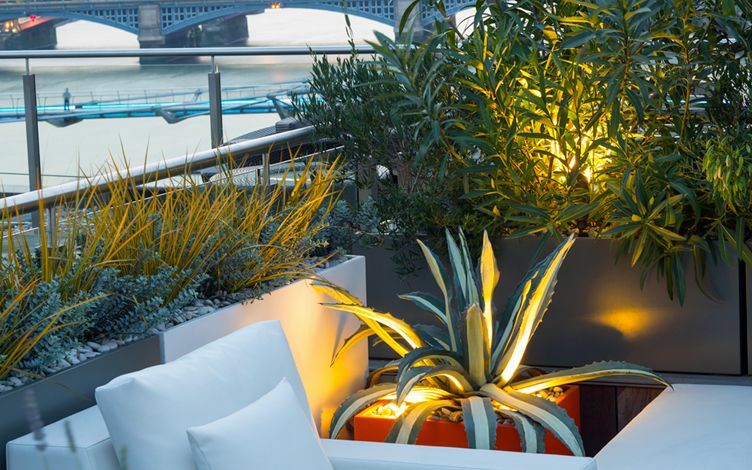 Garden: Eucalyptus, Maple and Palm trees, bespoke planters, smooth sandstone and flamed granite paved surfaces, raised beds, LED lighting, automatic irrigation, windbreak evergreen hedges. 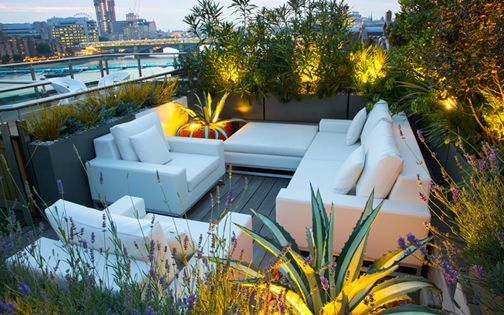 Roof: south-facing riverside penthouse, London EC4. Terrace: 50sqm. 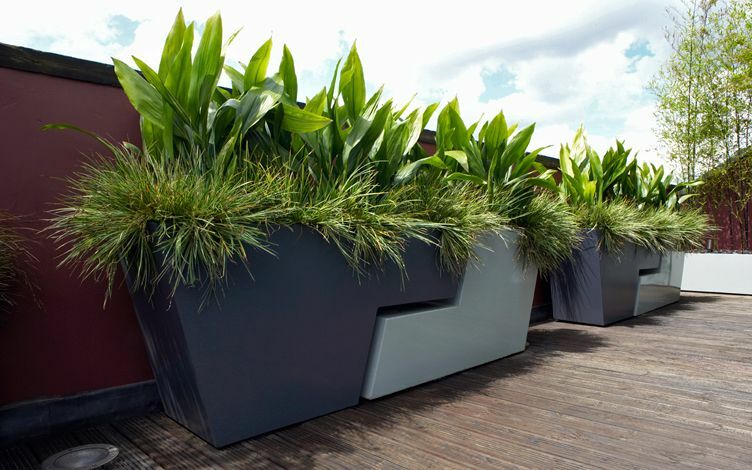 Garden: one-off planters in four contrasting colours, Oleander, Olive Palm and Pine trees, Manutti weatherproof furniture, LED lighting, Ipe hardwood decking, synthetic grass, Mediterranean planting including Agapanthus, variegated Agave, Arbutus, Dasylirion, Hebe and Stachys. 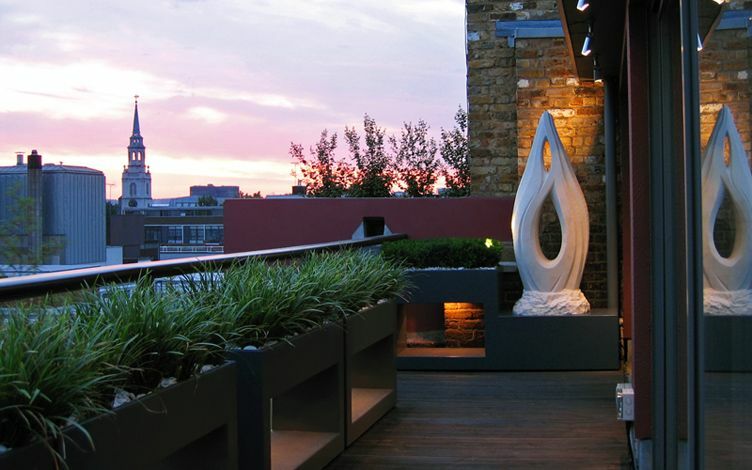 Roof: 5th floor converted wharf penthouse, London N1. 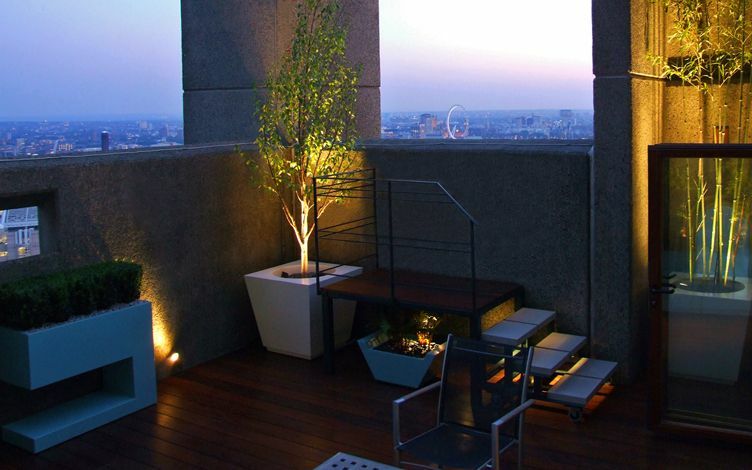 Terrace: 45sqm with a further small rooftop terrace. Garden: minimalist design, white colour spectrum, Silver birch trees, grasses, bespoke troughs, tree planters and curved vases, buff sandstone pavers, Balau hardwood decking, remote-controlled lighting, automatic irrigation system. Roof: 7th floor, north-facing city development, London SE1. Terrace: 40sqm. 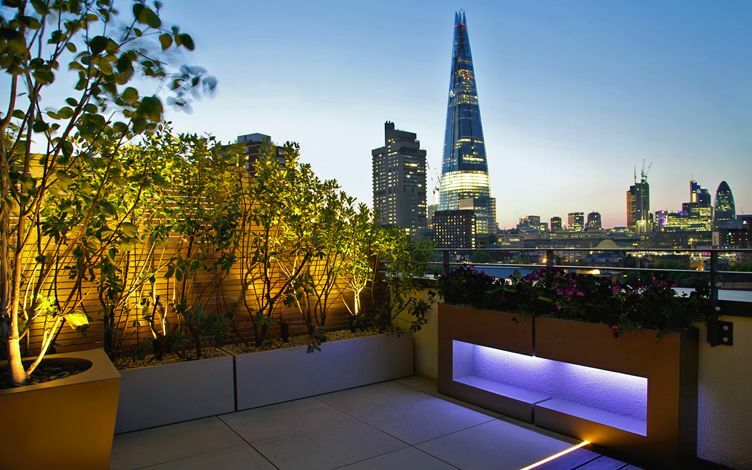 Garden: architectural, fitted planter designs responding to the nearby, prominent Shard silhouette, multilayered tree planting, Cedar-clad privacy screens, sandstone and wood surface, irrigation, lighting. 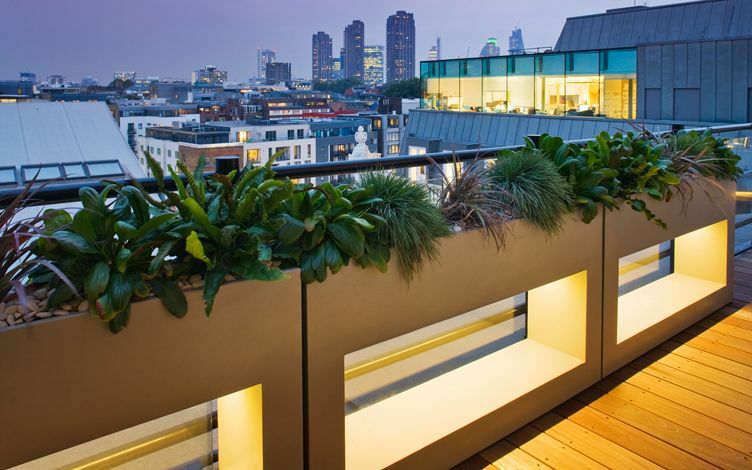 Roof: mid-rise, south-facing city penthouse, London EC1. 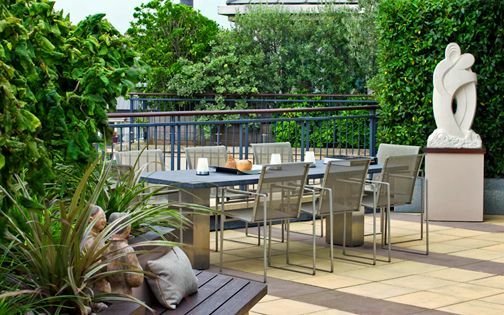 Terrace: 65sqm across 3 rooftop gardens. 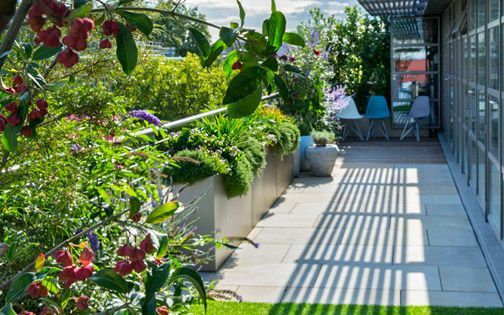 Garden: wildlife-friendly planting scheme, kitchen, herb and fruit gardens, artificial grass, sandstone and wood surfaces, powder-coated planters, native trees, evergreen privacy hedges, bespoke raised viewing platform to city landmarks. 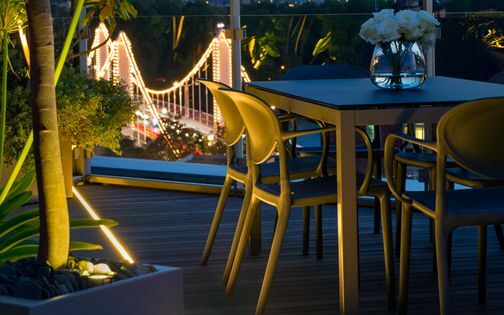 Roof: converted riverside wharf apartment, London E1. Terrace: 50sqm with a further upper rooftop. 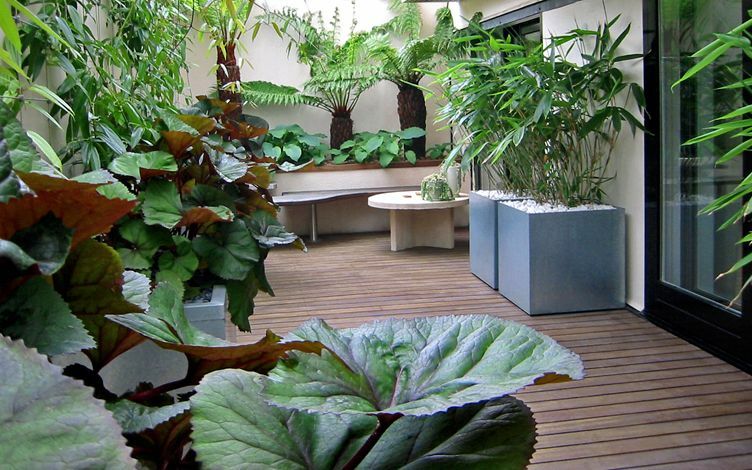 Garden: herb garden, living wall with a Cedar frame, synthetic grass, vibrant colour scheme, commissioned sculpture display, minimalist lit-up planter designs, split-level deck, smooth sandstone pavers, irrigation, bespoke LED strip lighting. 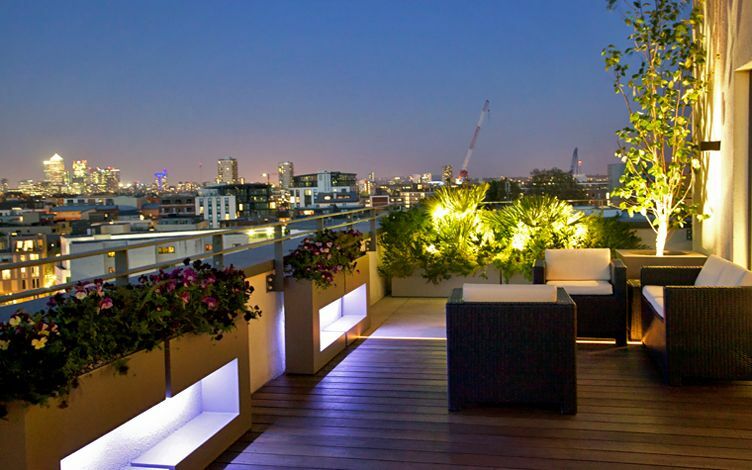 Roof: 5th floor triple aspect penthouse apartment, London EC1N. 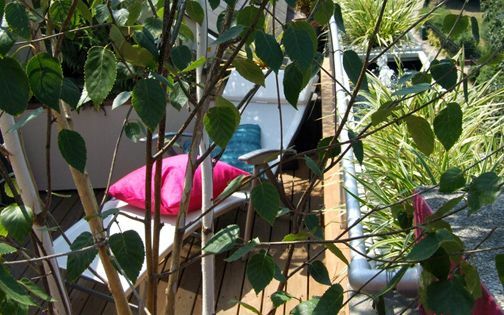 Terrace: 75sqm with a further green roof. Garden: indigenous floras with 250 plants in a diverse planting scheme forming a sustainable wildlife habitat, interspersed with culinary herbs, fruit and nuts. Roof: 6th floor, south-east facing penthouse, London E8. 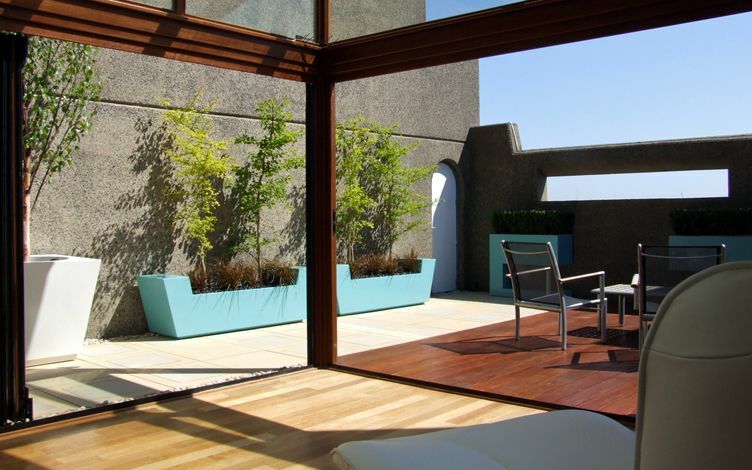 Terrace: 70sqm with a frameless glass balustrade. 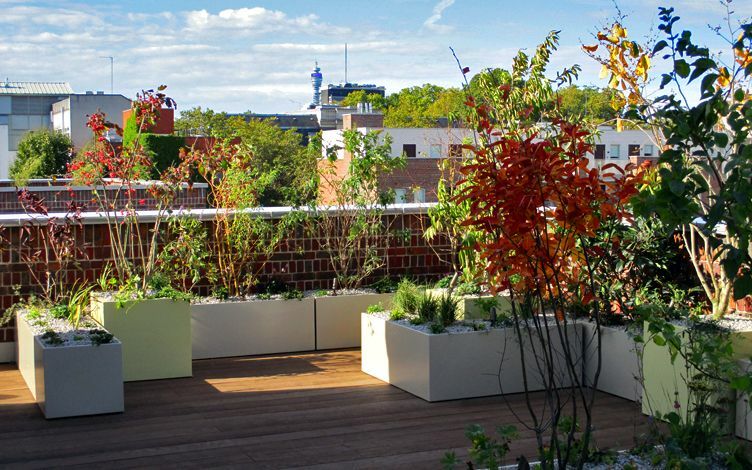 Garden: evergreen privacy hedging, 14 rooftop planters in 4 unique designs and 6 vivid powder-coated tints, specimen Olive trees, Agave and Phormium, structural plumbing, irrigation system under existing deck, outdoor lighting. Roof: 6th floor, Art Deco building, London EC1. 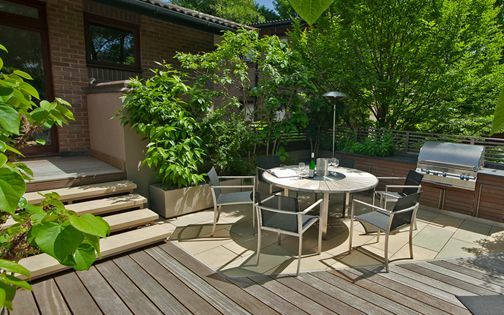 Terrace: 30sqm curved wrap-around. 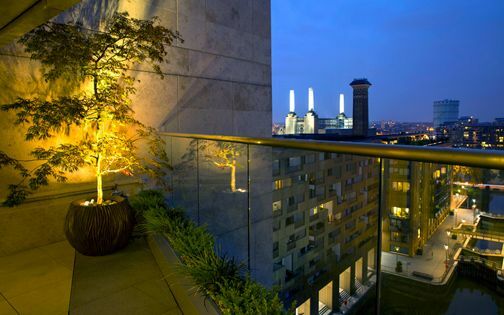 Garden: architectural Birch trees, slatted screens, black granite pavers, Balau hardwood decking, custom-designed troughs, circular lit-up tree planters, herb garden, irrigation, strip lighting. 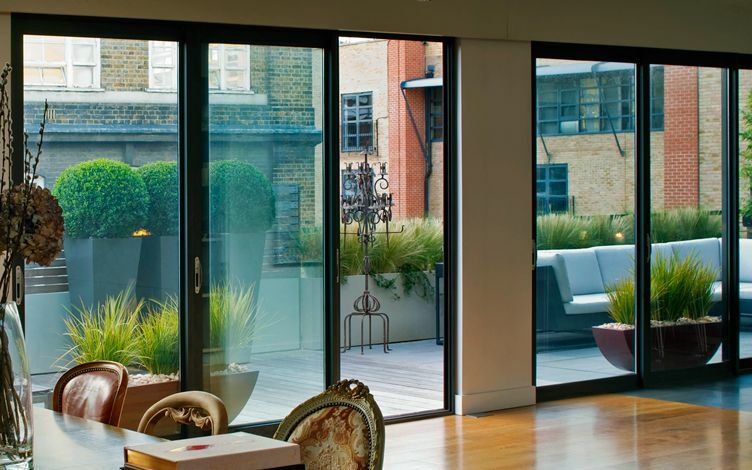 Roof: 5th floor warehouse conversion, penthouse apartment, London EC2. 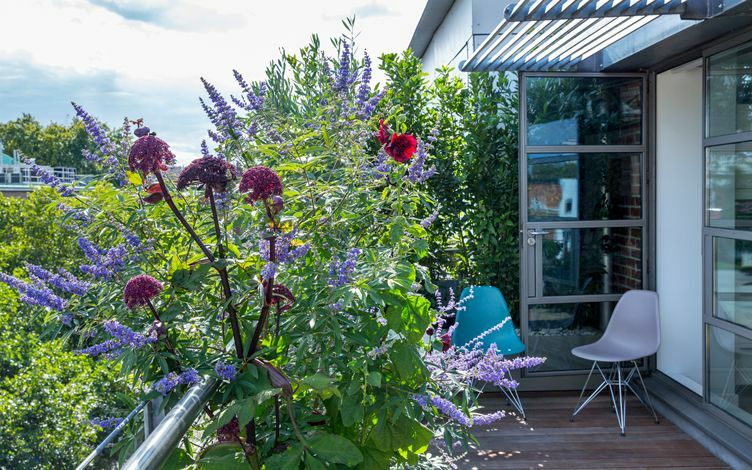 Terrace: 52sqm, north-facing with a further south-facing rooftop terrace. 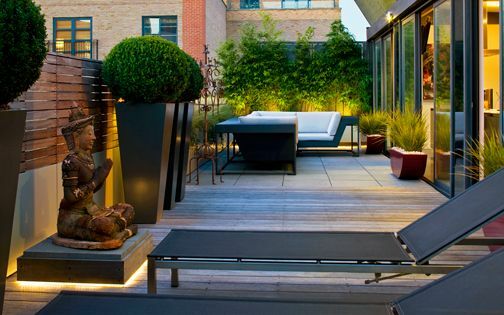 Garden: Ipe decking and blue granite pavers to match open-plan living room and kitchen surfaces, evergreen hedging and topiary, privacy cladding screens, ethnic sculpture display, 18 one-off planter designs in 4 shapes and 4 hues, Dedon furniture, heaters and sound. 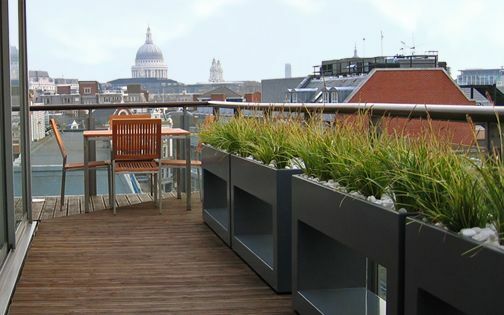 Roof: 40th floor penthouse triplex apartment, London EC2. 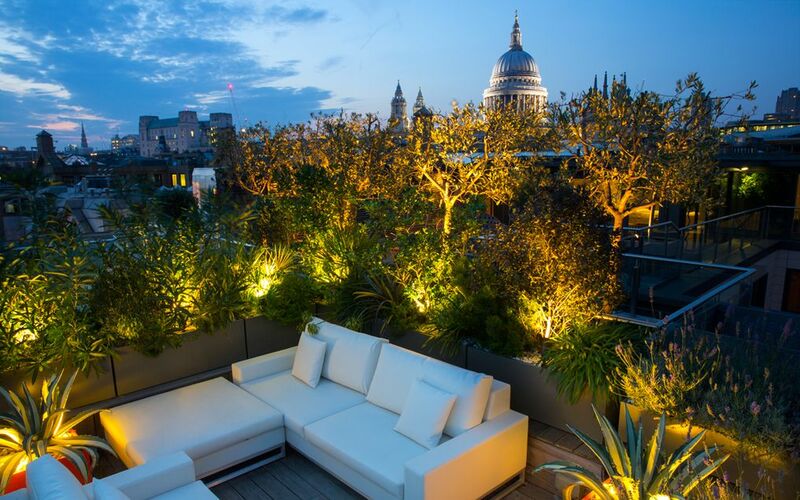 Terrace: 50sqm, south-facing with further two rooftop terraces. 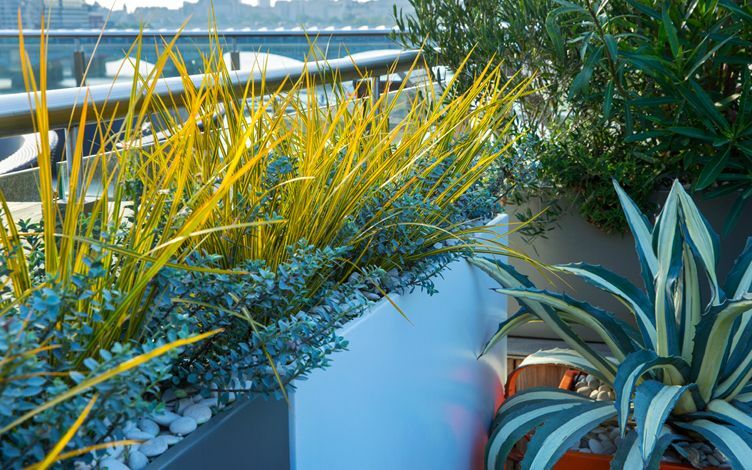 Garden: Ipe hardwood decking, blue and buff sandstone, evergreen Box hedging, Ginkgo, Chinese red birch and Olive trees, Tasman flax lilies and Red hook sedges, specially designed planting containers, a 1-metre-high movable landscape viewing platform to indulge in city panoramas.